Originally I thought I would have the food dispensed at the tables and something to collect the used food trays but that would have made the design too complex and take too long. After I modeled the tables and laid them out in the space I turned my attention to the ceiling of the Mess Hall. The ceiling design combines the design of a corridor ceiling and a room ceiling because the Mess Hall is part of the ship’s corridor. Once the ceiling was done I modeled light fixtures to be above each table. I matched the aesthetics of the light fixtures with the tables in a linear design ( sort of like the lights above a pool table). The outer “fins” of the lights are intended for soft ambient lighting while the spot lights borrowed from the exam tables in the Medbay would be for direct light on to the table surface. Next I moved on to the pass-through window where the crew pick up their food. 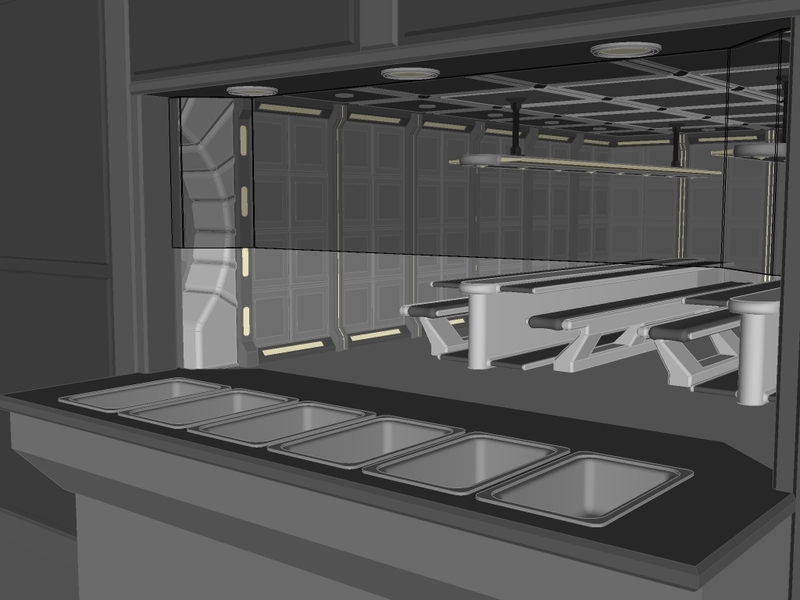 The Galley was initially going to be in its own bulkhead for safety reasons but it just wasn’t practical with how deep the pass-through counter would be so I combined the bulkhead sections instead. The pass-through has the same things you would expect in a cafeteria counter: a counter to slide your tray along as you get served, warmers to hold the cooked grub, heat lamps, a sneeze shield and a lunch lady wearing a hair net. Crew members can’t carry their food with their bare hands and eat with them so I needed to design a tray and utensils. Any Earthly design will do but I made something a little more specialized. The trays have a spot where the utensil snaps in place so not only does it stay attached when not in use, the tray and utensil can be cleaned without being separated. The trays can stack but without nesting so they can be cleaned while being stacked. The eating utensil is a fork on one end and a spoon on the other. Notice there is no knife… Wow, the food must be wonderful if there are no knives! The food trays needed a place to be stored near the pass-through so I decided on making a cabinet inside the Galley that would be open on the outside. I was going to make it so it would also be the appliance that would wash the trays but later I reduced it to just a cabinet that pierced through the wall with sliding doors on the Galley side. My primary goal with this ship is to finish it because it has taken a long time and I want to move on to something else. Spending time figuring out how to make something this insignificant in the scheme of things seems unnecessary. It seems I have forgotten to make a place for the dirty trays. That’s a problem… I’ll fix it. There needed to be more space for cooking so I made a griddle to go next to the cook-top I made earlier. The design matches the look of the cook-top and features a grease trap and side panels to prevent spills just like the real thing in a restaurant. Next I worked on the sinks in the Galley. First, there needed to be a sink for washing pots, pans, food trays and everything else. I modeled the sink to have a built-in drain board along with a pre-wash sprayer. Secondly, I modeled a three basin prep sink based on the design of the wash basin. Although not reflected in the pictures, I moved the sinks to the side wall in the corner of the Galley to make room for the wall ovens. The middle of the Galley was empty and, being that there was the lack of a proper prep area, I created a gigantic butcher block island. above the surface of the butcher block I modeled some simple light fixtures to light it up. Lastly, I worked on the storage room and the walk-in cooler. There is really not much to see here. The walk-in cooler has the typical looking door and shelves inside for storing uncooked food. The storage room uses the same shelves as the cooler and is used for storing dry and preserved goods. What’s next? I will write about the Crew Bunk Rooms and about the little detour I took before working on that. Tagged Cronuts, Galley, Mess Hall, SketchUp, starship.